What Is the Proper Way to Rack Pool Balls? Before starting a game of pool you need to set up the table for play. Pool has several variations, all of which require a different style of racking the balls. The most common rack is a triangle rack, which allows you to manipulate the balls to set up any type of game you decide to play. Learn the official method for racking pool balls for eight ball, nine ball, straight pool and ten ball. Place the triangle rack on the pool table and set up all 15 balls within the triangle in random order. Arrange the balls so that one striped ball and one solid-colored ball are in the corners of the last row of the rack. Set the eight ball in the middle position of the third row of the rack. Keep the other balls in their random location after finishing Steps 2 and 3. Slide the rack over the poker table felt so that the ball in the first row sits on top of the foot spot, which is the light spot in middle of the table used as a guide for positioning the rack. Sit the triangle rack on the table and place the balls numbered 1 through 9 within the triangle. Position the balls in random order split among five rows so that the balls form a diamond; the first and fifth row will have one ball, the second and fourth rows will have two balls and the third row has three balls. Many pool halls have a diamond rack so that you do not have to shape the balls in the triangle rack. Place the one ball at the top of the triangle and the nine ball in the middle of the third row; the remaining balls should stay in random order. Position the rack so that the one ball sits on top of the foot spot. Set the triangle rack on the table and place all 15 pool balls within the rack in random order. Position the rack so that the first ball sits on the foot spot on the table. 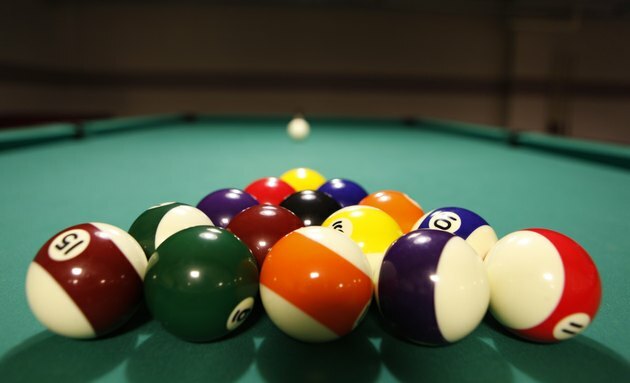 Place the empty triangle rack in its final resting location over the foot spot on the table once 14 balls are knocked into the pool table pockets to see if the final ball falls within the rack. Rack the 14 balls without the final ball if it does not fall within the rack, leaving the top position open. Include the final ball in the rack if it does rest within the rack. Continue in this manner until one player reaches the determined number of points and wins the match. Position the triangle rack on the pool table and place the balls numbered 1 through 10 in a random, triangle pattern. The rack will consist of four rows. Move the one ball to the first position in the triangle and the 10 ball to the middle position in the third row. Slide the rack over the table so that the one ball rests on the foot spot. Make the rack as tight as possible, especially racking a game of nine ball with a triangle rack or a game of ten ball. You will find extra space in the rack when racking the balls for these games, and you need take care to keep the balls in their proper position.